How many movies about the boyfriend trying to win over his girlfriend's father have there been? Plenty, and the first one that comes to mind is the atrocious Guess Who with Ashton Kutcher and Bernie Mac. Not looking too much different, minus the whole racial component I guess, is Why Him?, which stars James Franco as the guy trying to get on Bryan Cranston's good side. Wait, James Franco and Bryan Cranston? Oh, so that's why this movie exists. Also starring Zoey Deutch, who is always a treat, the film centers on a socially-awkward tech billionaire who endeavors to win over his girlfriend's father so he can ask for her hand in marriage. If there's any way for this to go beyond the basic formula it will be the cast. 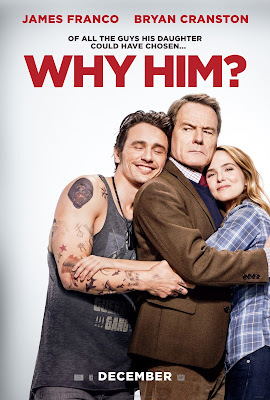 Franco is pretty good at playing clueless oafs, and Cranston is great when tightly wound. The rest of the supporting players are solid, as well, with Megan Mullally, Keegan-Michael Key, Casey Wilson, Adam Devine, and Andrew Rannells. Directed by John Hamburg (Along Came Polly), Why Him? opens Christmas Day.